Well the preacher come round here with his face all bright. He told me in a little while it’ll be alright. He said he could remember when he used to play down there. What happened to you mining people well it’s just not fair. There are women and children crying all round the square. Already some families are moving away from there. I got a brother in Australia who said I should go out there. But I know I’ll never feel settled down anywhere. Now I’ve got some time left here before I go. My case is packed and sitting outside the door. 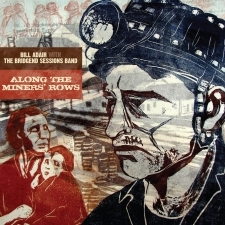 From the album "Along The Miners' Rows"
Music and lyrics are the copyright of Bill Adair. You may use the songs and you may print the lyrics in order to learn them but you may not reproduce any of this material in written, printed or recorded form, online or offline, for any other purpose than your own personal use without permission from the copyright owner. The use of any of the content, written or recorded, for any commercial or profitmaking purpose online or offline is totally prohibited.